One type of business structure is a partnership. But what really is a partnership? The Uniform Partnership Act defines a partnership as “an association of two or more persons to carry on as co-owners a business for profit.” The basic, default rules for a partnership are that all partners are agents of the partnership, and all partners may be liable for the debts of the partnership. All partners have an equal share in the business. These default rules, however, may be legally modified by contract. There are three types of partnerships: (1) the general partnership (GP), (2) the limited partnership (LP), and (3) the limited liability partnership (LLP). These types of partnerships have slight differences that can have different legal implications depending on the situation. However, those differences are not the subject of this article. Sometimes it is difficult to know for sure whether a partnership is formed or not. It is important to know the basic criteria indicating whether a partnership exists. For example, in a partnership the partners have the right to share in the profits, and also the obligation to share in the losses. In a partnership, all partners also have some power or control over the business. If there are other terms to the agreement between the partners, the partnership agreement should specify this. While a partnership may exist without any written document evidencing its existence, it is always better to create a written partnership agreement to formalize the intent of the partners and avoid any future disagreements that inevitably arise when agreements are in the parties heads instead of on paper. WHAT IS THE STANDARD OF CONDUCT BETWEEN PARTNERS IN A PARTNERSHIP? The law imposes obligations on partners in a partnership. It is important for a partner to understand these obligations to avoid the consequences of (inadvertently) violating legally defined duties. The two primary obligations owed by partners to each other (and to the partnership) are the duties of loyalty and care. Perhaps the most important of all duties a partner owes to the partnership is a duty of loyalty. This duty is manifest expressly in the Revised Uniform Partnership Act § 404. Section 404(b) limits the duty of loyalty to three specific duties. Duty to account to the partnership, to act as a trustee and hold, for the partnership, any property, profits, or benefits the partner derived in the conduct and winding up of the partnership business. This includes the obligation for each partner to not appropriate a partnership opportunity for the benefit of the individual partner and not the partnership. Duty to refrain from competing with the partnership before the partnership dissolves. The duty of loyalty between partners is highly regarded by courts. For example, in a majority Supreme Court opinion Justice Cardozo stated that the duty of loyalty between partners was “the duty of the finest loyalty.” He also stated that partners owe a type of loyalty to one another that is not “honesty alone, but the punctilio of an honor the most sensitive.” (see Meinhard v. Salmon, 249 N.Y. 458, 464 (1948). This rule was cited in a case where a business partner executed a transaction that arose from his partnership for his personal benefit without telling his partner. The Revised Uniform Partnership Act, Section 404 addresses the other primary duty of partners in a partnership—the duty of care. But how is the duty of care different from the duty of loyalty? In RUPA Section 404(c) the duty of care is simply defined as a duty of refraining from “engaging in grossly negligent or reckless conduct, intentional misconduct, or a knowing violation of law.” Note that the duty of care does not include mere negligence (unless agreed to in the partnership agreement). Mere negligence can include simply failing to make a reasonable or proper business decision. For a partner to breach his or her duty of care, the partner needs to engage is something worse than mere negligence—the conduct has to arise to the level of at least gross negligence (or worse, reckless intentional misconduct). The law imposes the duty of loyalty and the duty of care on partners in a partnership and provides some protection and some legal remedies if a partner breaches one of these duties. If you have a question regarding the conduct of a partner in a partnership and whether it comports with the law, it is best to seek out a competent business law attorney. 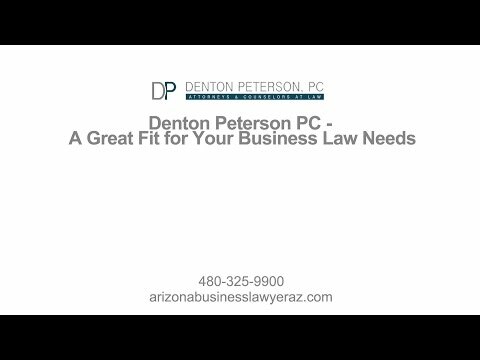 An experienced Arizona business attorney at Denton Peterson, PC can help you understand if you are in a partnership and can explain the rights and obligations of those within a partnership. Call us today!